The Sleep Disorder Center at Scott County Hospital provides state of the art evaluation and treatment of sleep disorders for all ages in a caring environment in order to improve the quality of life for those we serve. Our goal is to educate the general public and physicians on the importance and potentially serious consequences of untreated sleep apnea and sleep disorders. The Sleep Disorder Center provides two private bedrooms with bathrooms and a living room area to provide a home-like ambiance. We can treat both adult and pediatric patients, including weekends to better fit your schedule. Your primary care physician can refer you to the Sleep Disorder Center. Patients will follow up with Dr. Junqueira or Dr. Shapiro once the study is completed. A lack of effective sleep does more than just make you grumpy or groggy. Interrupted sleep can cause daytime sleepiness, which increases your risk for accidents. Poor sleep can also significantly impact mood and memory. Your sleeping problem could be caused by obstructive sleep apnea, which may increase your risk for heart attack, stroke, diabetes, high blood pressure, and obesity. When you consider the health benefits of a good night's sleep, it's worth making sure your sleep time is time well-spent. Our Sleep Technicians can help eliminate, under Dr. Junqueira or Dr. Shapiro's guidance, the risk bad sleep habits can put on your overall health and treat specific issues. To better serve you, our technicians are bi-lingual. Sleep disorders in children may lead to daytime moodiness, irritability, lack of focus in class, sleepiness in school, inability to get up in time for school, and significant behavioral and learning problems. Some sleep disorders are serious enough to cause adverse cardiovascular and metabolic effects as well as failure to thrive. The Sleep Disorder Center is currently treating pediatric patients. 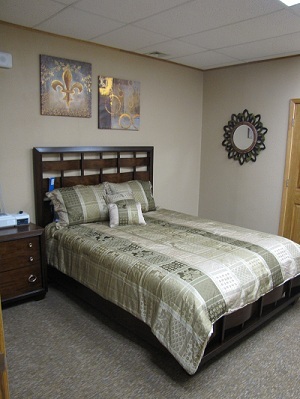 The Sleep Disorder Center provides two private bedrooms with bathrooms and a living room area to provide a home-like ambiance. We can treat both adult and pediatric patients, including weekends to better fit your schedule. Your primary care physician can refer you to the Sleep Disorder Center. Patients will follow up with the Doctor once the study is completed. Sleep disorders can be effectively treated once accurately diagnosed through a sleep study. Treatments are covered by many insurance companies. If you have questions about coverage, it is best to contact your insurance company. For information about the Sleep Disorder Center, please call (620) 874-4856.